This year’s World Series of Poker is officially starting tomorrow, and the poker community is getting ready a month filled with poker action. It will be a big year since the organizers went overboard and put together over 69 events for the entire series. The entire series this year is a celebration of the game, and players who want to participate will have the chance to play their favorite poker variations. Started in 1970, the World Series of Poker was aimed at popularizing the game. What used to be an invite-only event, the World Series has evolved from a simple series of cash games into a dizzying array of satellite tournaments and big-money events. It still retains its mystique, though. The online poker boom of the 2000s can be directly laid at the feet of Chris Moneymaker’s win in the 2003 World Series of Poker. Unlike other sporting tournaments, the prize for winning any of the events in the World Series of Poker is not a trophy but a gold bracelet. Owning and proudly displaying a winner’s bracelet is a point of pride for past winners and an acknowledgement of their skills. For a poker lover, joining up is a dream come true. However, it can be a grueling exercise. 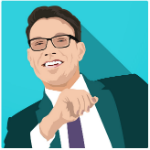 For those who want to sign up for it, there are a few facts they need to know. First of all, players can be selective about which of the games they join. The 69 events have different variations that should give anyone a wide array of choices. Some games are run using the Texas Hold ‘Em rules, but there are other tournaments using other rules like Omaha, Lowball, and Stud. There are even tournaments. Beginners do not need to worry about being sidelined if their favored rules are not being used. Secondly, the main goal of the players for each tournament is to be the last one standing. This means that players need to be careful about their bankroll. It is best if a player will have a large bankroll, but careful management and skillful play can turn a small bankroll into a big one. Finally, a player who is aiming to be part of the main event can do it the hard way by participating in the various satellite tournaments. It is not necessary, though. All a player needs to do to join the main event is to have $10,000 and to buy in. If a potential player does not have money, then they will need to join a satellite tourney, which has a lesser buy-in. The main event is usually around early July, after a grueling month of play. For the event itself, players will use their buy-in to get chips to play. Players cannot exchange these chips for cash, but they denote whether a player is still in the tournament or not. If they run out of chips, then they are eliminated. The buy-in is then added to the prize pool that will be awarded to the top finishers. Only the 10 percent will get a payout. Considering that the usual amount of players for the main event exceeds a thousand players, only around a hundred of them will get any money. Once the main event begins, players will be grouped in tables. As players are eliminated, people will be moved from table to table to keep them balanced. Normal play will continue until only a single table of nine is left. This is not the real finals, though. The last nine players will comprise the last table of the main event. In 2008, ESPN wanted to build a little buzz for the tournament, and this resulted in the final table being delayed to October. The World Series of Poker is an event any player should not miss. 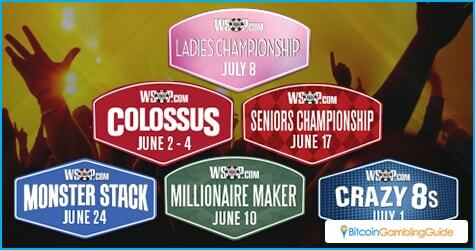 Players can easily watch out for the Colossus on June 2 to 4 or find their fate in the Seniors Championship and the Monster Stack on June 17 and June 24, respectively. 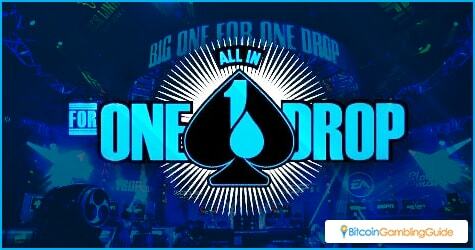 The main event, however, is not due until July 9, and will be followed by the One Drop on July 12 to 14. Granted that not everyone can be at the events lined up this year, poker aficionados can still experience the action poker when they play Bitcoin poker online. Better yet, they can watch out for the various World Series of Poker promos that give out great payouts and even a chance to grace the Main Event in July. Last year, a number of Bitcoin poker sites launched their WSOP-inspired bonuses and promotions, with Americas Cardroom rolling out its World of Series of Jackpots.